The first astronomers had a limited toolkit: their eyes. They could only observe those stars, planets and celestial events bright enough to pick up unassisted. But today’s astronomers use increasingly sensitive and sophisticated instruments to view and track a bevy of cosmic wonders, including objects and events that were too dim or distant for their sky-gazing forebears. On Nov. 14, scientists with the California Institute of Technology, the University of Washington and eight additional partner institutions, announced that the Zwicky Transient Facility, the latest sensitive tool for astrophysical observations in the Northern Hemisphere, has seen “first light” and took its first detailed image of the night sky. When fully operational in 2018, the ZTF will scan almost the entire northern sky every night. Based at the Palomar Observatory in southern California and operated by Caltech, the ZTF’s goal is to use these nightly images to identify “transient” objects that vary between observations — identifying events ranging from supernovae millions of light years away to near-Earth asteroids. In 2016, the UW Department of Astronomy formally joined the ZTF team and will help develop new methods to identify the most “interesting” of the millions of changes in the sky — including new objects — that the ZTF will detect each night and alert scientists. That way, these high-priority transient objects can be followed up in detail by larger telescopes, including the UW’s share of the Apache Point Observatory 3.5-meter telescope. Identifying, cataloguing and classifying these celestial objects will impact studies of stars, our solar system and the evolution of our universe. The ZTF could also help detect electromagnetic counterparts to gravitational wave sources discovered by Advanced LIGO and Virgo, as other observatories did in August when these detectors picked up gravitational waves from the merger of two neutron stars. But to unlock this promise, the ZTF requires massive data collection and real-time analysis — and UW astronomers have a history of meeting such “big data” challenges. The roots of big data astronomy at the UW stretch back to the Sloan Digital Sky Survey, which used a telescope at the Apache Point Observatory in New Mexico to gather precise data on the “redshift” — or increasing wavelength — of galaxies as they move away from each other in the expanding universe. Once properly analyzed, the data helped astronomers create a more accurate 3-D “map” of the observable universe. The UW’s survey astronomy group is gathered within the Data Intensive Research in Astrophysics and Cosmology (DIRAC) Institute, which includes scientists in the Department of Astronomy as well as the eScience Institute and the Paul G. Allen School of Computer Science & Engineering. “It was natural for the UW astronomy department to join the ZTF team, because we have assembled a dedicated team and expertise for ‘big data’ astronomy, and we have much to learn from ZTF’s partnerships and potential discoveries,” said UW associate professor of astronomy Mario Juric. From Earth, the sky is essentially a giant sphere surrounding our planet. That whole sphere has an area of more than 40,000 square degrees. 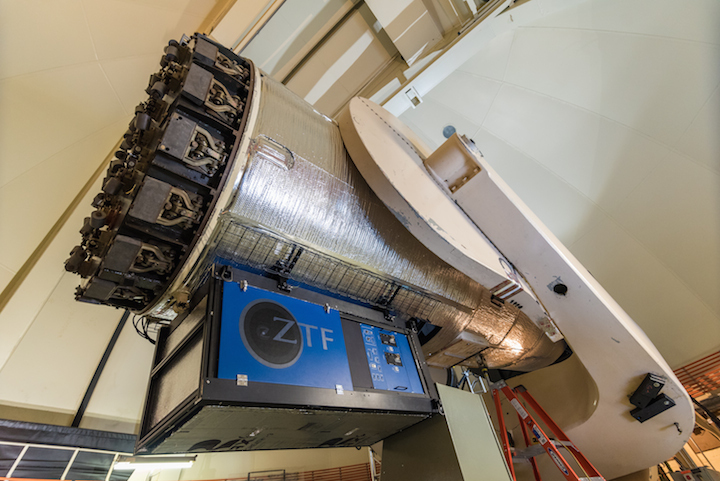 The ZTF utilizes a new high-resolution camera mounted on the Palomar Observatory’s existing Samuel Oschin 48-inch Schmidt Telescope. 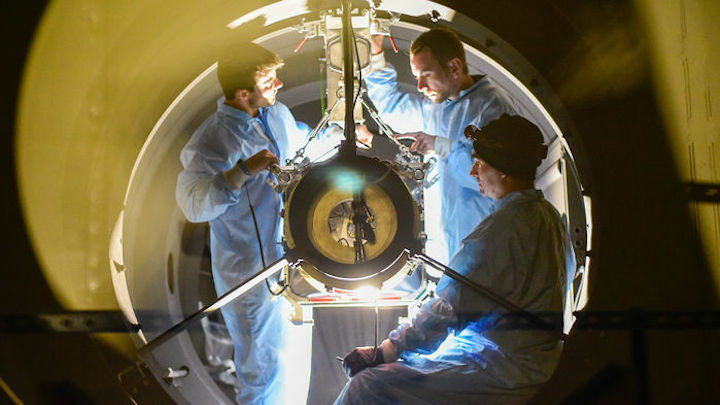 Together these instruments make up the duet that saw first light recently, and after months of fine-tuning they will be able to capture images of 3,750 square degrees each hour. These images will be an order of magnitude more numerous than those produced by the ZTF’s predecessor survey at Palomar. But since these transient objects might fade or change position in the sky, analysis tools must run in near real time as images come in. From a data analysis standpoint, these are no easy tasks. 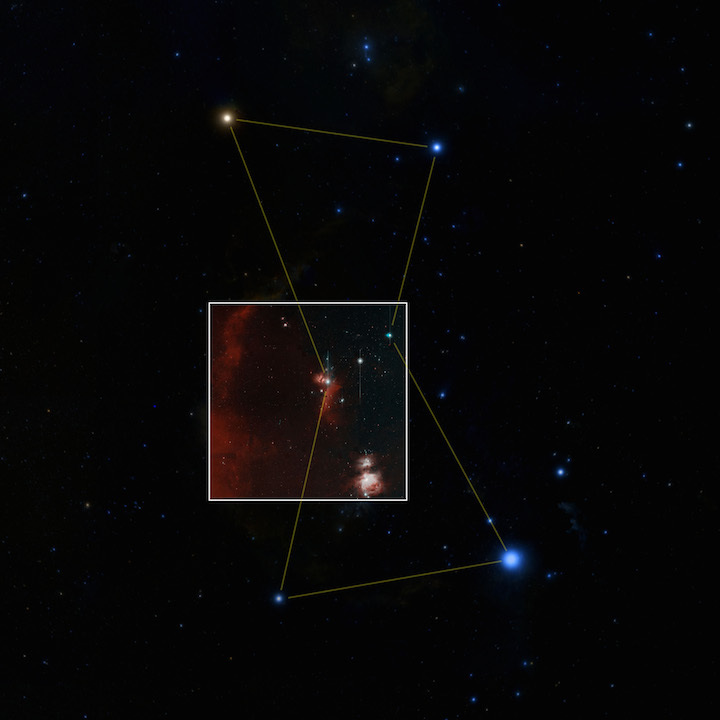 But, they’re precisely the sorts of tasks that UW astronomers have been working on in preparation for the Large Synoptic Survey Telescope, which is expected to see first light in the next decade. 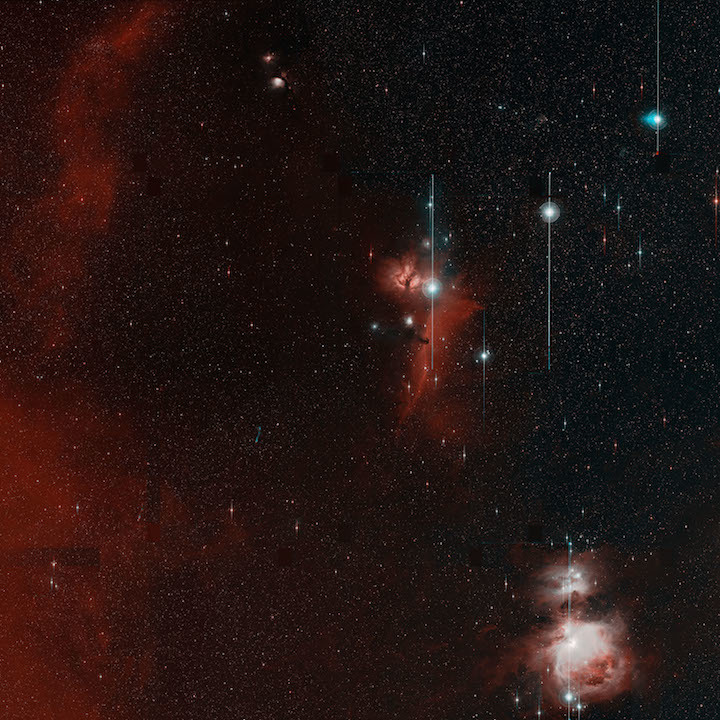 The LSST, located in northern Chile, is another big data project in astrophysics, and is expected to capture images of almost the entire night sky every few days. “Data from the ZTF surveys will impact nearly all fields of astrophysics, as well as prepare us for the LSST down the line,” said Juric. The ZTF is funded by the National Science Foundation and its partner institutions. The UW’s participation with the ZTF was made possible by funds provided by the College of Arts & Science, the DIRAC Institute and the Washington Research Foundation. The DIRAC Institute is funded in part by the Charles and Lisa Simonyi Fund for Arts and Sciences.